The Historic Ontario Road Network (ORN) files provide time sensitive data and periodic updates to the ORN database. Please note these files are superseded by more recent editions and are to be used with caution when interpreting data and results. The Ontario Road Network (ORN) is a province-wide geographic database of over 250,000 kilometers of municipal roads, provincial highways, and resource and recreation roads. 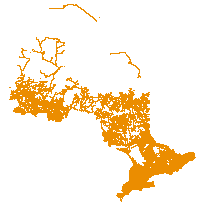 The ORN is considered the authoritative source of roads data for Ontario. The ORN Segment with Address is derived from the Linear Referencing System (LRS) data set and provides attributes such as: official street names, alternate street names, route names and numbers, street address ranges, road class, direction and municipality. A segmented dataset is comprised of distinct road segments based on attribution associated with each segment. A road segment is the linear geometry of the road. Road segments can be consolidated into networks using the MNR Road Network entity. To exist in the Road Segment layer the road must have actually existed as a path supporting conventional four-wheel street legal vehicles. Supplementary data can be used and are available for download from the additional documentation section. Supplementary maps are available for download from the additional documentation section. The ORN is available in both a Linear Referencing System (LRS) format - ORN Road Net Element - suitable for use in asset management systems. A segmented format - ORN Segment with Address is suitable for use in routing, geocoding, and mapping applications. The ORN is a horizontal initiative which reduces government duplication, i.e. all three levels of government working in the creation, maintenance and sharing of a common and standard road centreline database across Ontario. The ORN has a positional accuracy of 10 metres or better. It includes descriptions of road characteristics, such as street names, highway numbers, addresses, road classifications, surface type, direction of traffic flow, and speed limits. The ORN is available in both a Linear Referencing System (LRS) format, suitable for use in asset management systems, and a Segmented format, suitable for use in routing, geocoding, and mapping applications. The ORN is also available as a Web Map Service (WMS) allowing users to access current data directly into their GIS software. The ORN Road Net Element is a Linear Reference System (LRS) data set and includes attribute information such as: official street names, alternate street names, street address ranges, road class, direction and municipality. Other attribute events include blocked passage, toll point, junction, direction, jurisdiction, structure, road surface, route names and numbers, number of lanes and speed limit. A LRS localizes features (points and segments) by a measurement along a linear segment. Location based information related to resource access roads are a responsibility of both local and main office levels within the MNR. Geospatial data containing the x, y ground coordinates of the road centreline plus a series of descriptive attributes associated with the road is created and maintained through the MNR's corporate editing tool. The MNR Road Segment also contains roads not under the jurisdiction of the MNR (municipal roads and provincial highways) which are sourced from the Ontario Road Network (ORN). The ORN also contains resource roads which are sourced from the MNR Road Segment.